C5. Jet stream blocked by naval combat? The most forceful meteorological blocking of the 20th Century, if not during the last 150 years or longer, was established at the onset of the Second World War in autumn 1939. The subject was never recognised scientifically. On the other hand recent atmospheric blocking events received much attention. Why was the winter 2009/2010 unexpectedly the coldest winter for 30 years? Why was Russia caught in a heat wave in summer 2010? And why had the global mean temperature for December 2010 actually been below the previous 30-year mean? 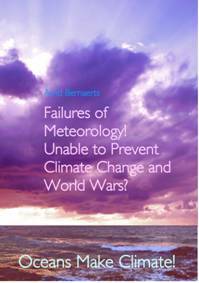 Many questions, for which more convincing answers would be available, if science had been more conscientious about what had happened at the onset of WWII, namely, what had caused the blocking of usual weather patterns in autumn 1939, and whether that had anything to do with naval war activities in the seas off European coast lines. The 'west wind zone', or west-wind -drift (WWD) as the German weather service used to call it, is defined as the atmospheric circulation of air in the mid-latitudes of the earth (about 40 degrees and 60 degrees), which may extend up to the latitude of 70 degrees. As part of the planetary circulation, it always runs from west to east. Any disorders in the circulation causes severe undulations, i.e. the flow has deflections from north or south. At high altitudes (10-15 km) the air circulation is called "jet stream" that can achieve a speed of 500 km per hour. Up to WWII little was known about the "jet stream", while the general circulation was summarized in meteorology as: The Westerlies. How did a disturbance of circulation come about in 1939? This will be discussed below. The weather was fine when the Deutsche Luftwaffe and Wehrmacht (German Air Force and Army) had begun the invasion of Poland at its western borders at 04:48 local time on September 1st, 1939, while the first naval gunfire of World War II came from the old German battleship “Schleswig Holstein” which bombarded the Polish military transit depot at Westernplatte in the Free City of Danzig on the Baltic. 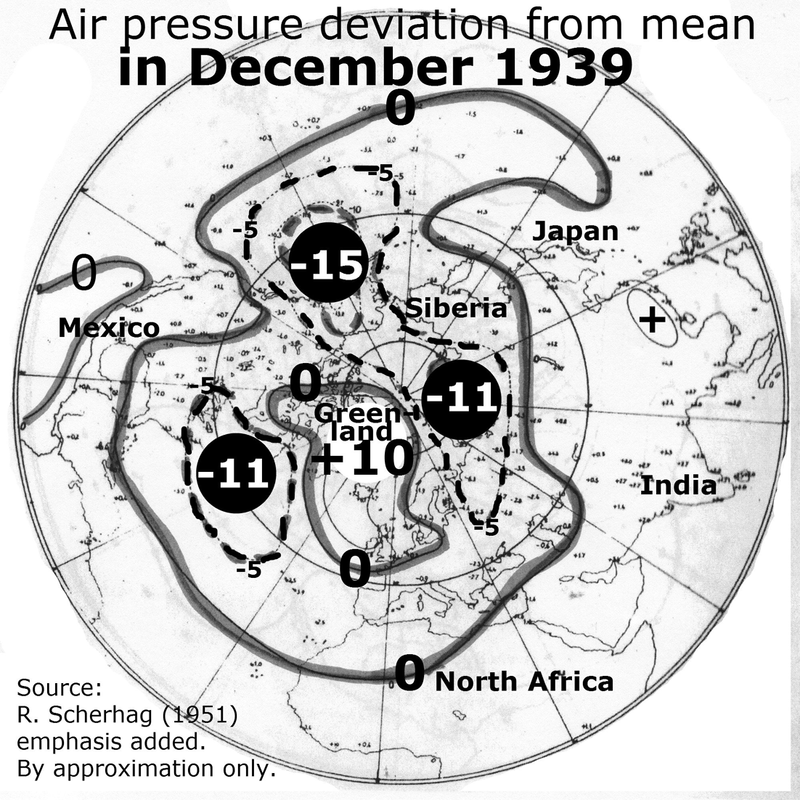 · September 01, 1939 : Over Central Europe (CE) air pressure increases. · September 02, 1939 : Modest pressure changes in CE. The general weather situation is determined by an extensive Low pressure system over the North Atlantic and a High over Northern Scandinavia . 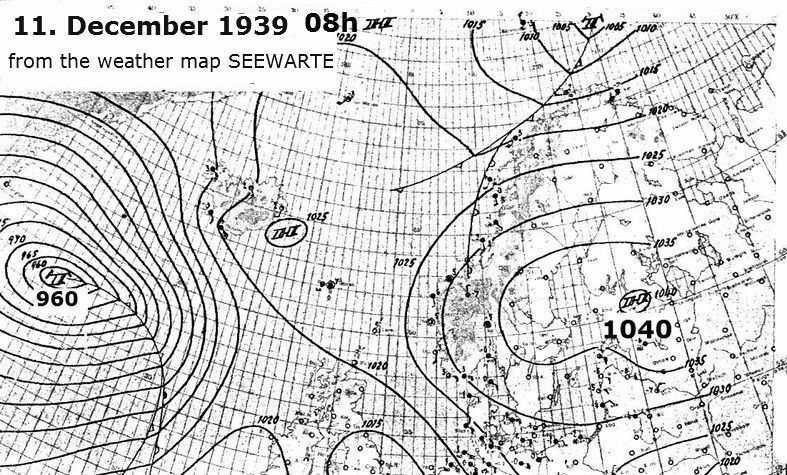 · September 03, 1939 : In the east of the Scandinavian High, polar cold air is pushed toward Germany . · September 04, 1939: The cold air thrust (Sept. 3rd) has reached the Black Sea and Caspian Sea . 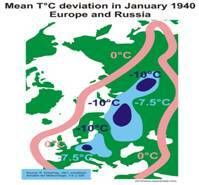 · September 05, 1939 : The center of the European Highs has moved further south-eastwards. The usual flow of circulation may have been affected by numerous war activities. I want to discuss only one example, which links naval activities to the movement of a cyclone, and is one aspect that eventually contributed to atmospheric blocking of the jet stream over Europe . 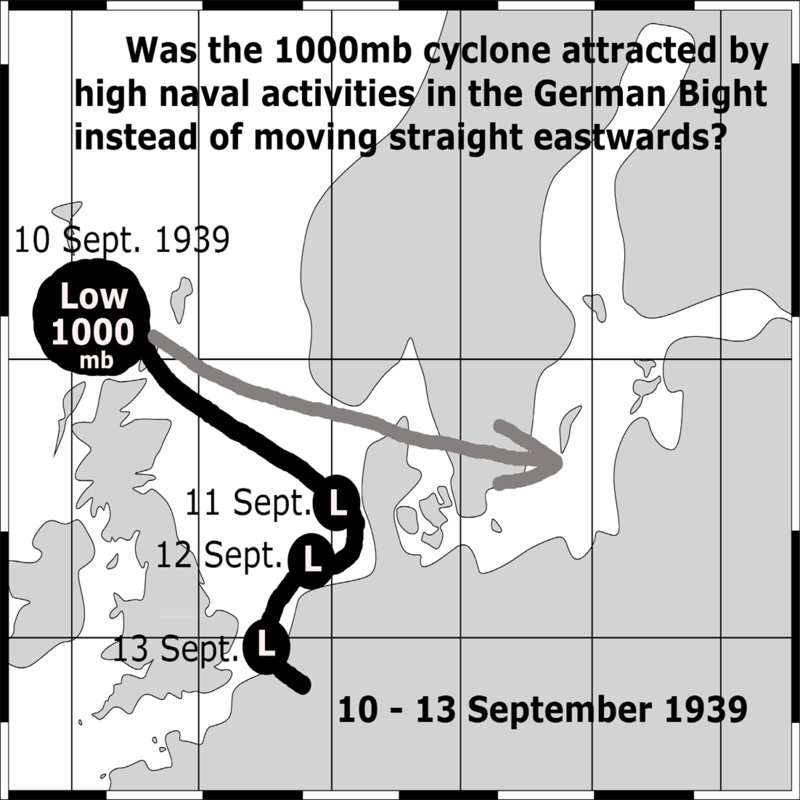 The story lasted from September 10th to 13th, and could be entitled: Cyclone attracted by naval warfare activities in the Helgoland Bight (German Bight). A huge number of the Kriegsmarine vessels were stationed in the North Sea from day zero, and were highly active. The Royal Navy and Air Force showed up several times around the island of Helgoland and the German coast with submarine, bomber and sea mine laying missions. The German Navy was particularly engaged in planting contact mines from Holland ’s coastal waters (off Terschelling) northwards across the German Bight up to the entrance of the Skagerrak, at a distance of between 50 and 100 km off the coast of Schleswig-Holstein and Denmark , called the “Westwall”. The most north-westerly point announced by the Germans as ‘Dangerous zone’ was the position: 56° 30’ North and 4° 25’ East. That was about half the distance between Skagerrak and Scotland . The first minefield locations were off Terschelling, Esbjerg , near Helgoland and two places off Jutland . (NYT, September 5, 1939) As many as 300 mines an hour could be laid by one single minelayer. (NYT, February 18, 1940), and the German Navy had presumably several dozens in service to plaster the North Sea off the German coast with tenthousand sea mines. In the north of Scotland a low arrived on September 10th, presumably bound to travel via Skagerrak eastwards to the Baltic and beyond. It almost did, but before entering the Skagerrak it swung southwards and moved straight to the center of naval activities, and further along Holland to the Belgian coast on September 13th, as shown in Fig. C5-4. And again just two days later on the 15th, at 8 a.m. , there was a small low-pressure center (1005 mb) north of Helgoland (not shown) close to the location of meanwhile already large sea mine fields. 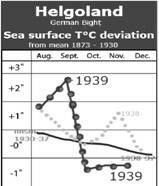 During September 1939 the sea water temperature decreased at the station of Helgoland which is so unusual that one has to take notice, Fig.C5-5. First there is an increase of one degree, then a drop of three degrees below average in September. A higher figure for a corresponding period as in September 1939 had only once before been recorded, i.e. in September 1875. 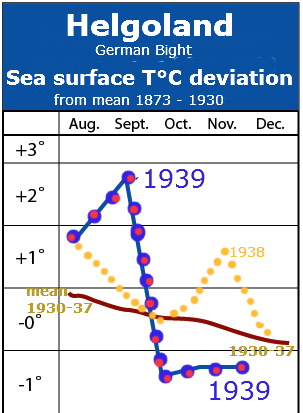 The steep rise and drop in September 1939 has something to do with extensive naval ship movements and military activities that took place, ‘shovelling’ lower and warmer water up to the surface. Once warmer water reached the surface, evaporation increased and subsequently seawater cooled more quickly. It is as simple as that, and in this case it can obviously be demonstrated. 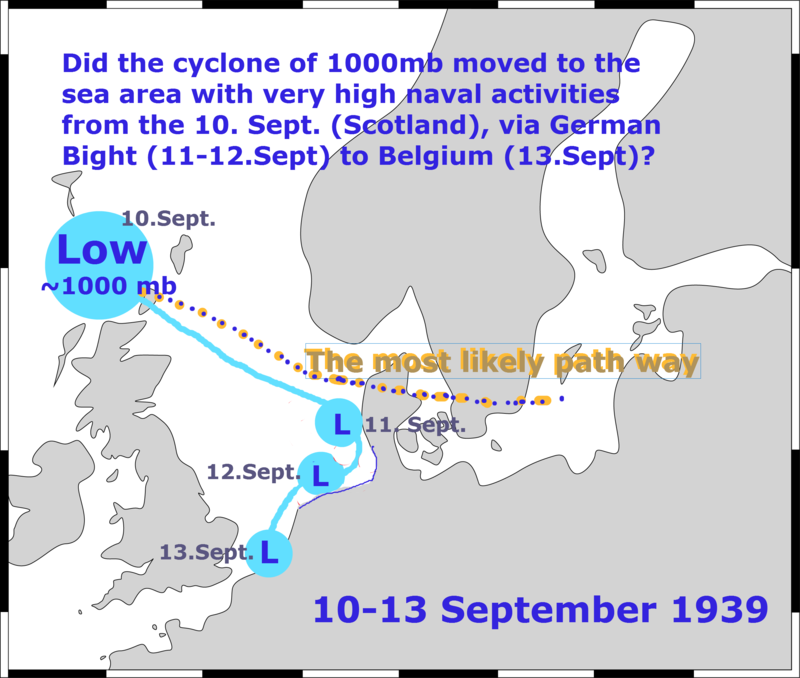 It is also the explanation why the cyclone movement from September 10th to 13th chose a path via the German Bight, which actually contributed to more continental conditions, by taking the heat out of the North Sea too early. On this occasion it was only a very small proportion, but many thousand further events over the next months eventually established the blocking. · September 19, 1939; Cyclonic activity over the Polar Sea area is high. The west-drift in the North will susequently move more and more towards the South. 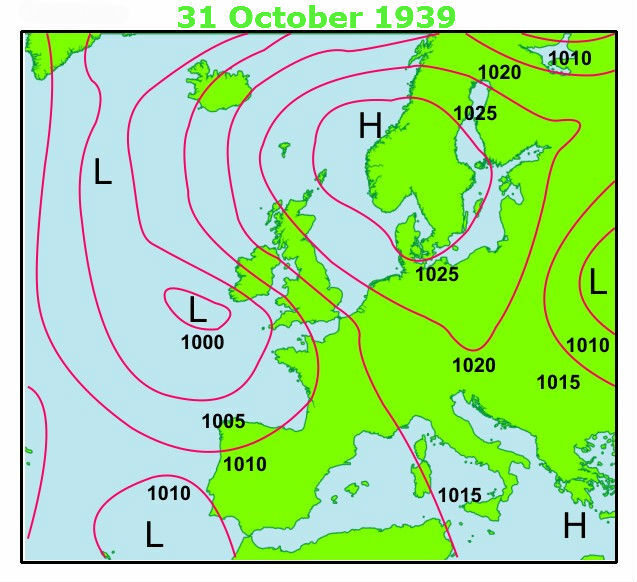 · September 23, 1939 ; with the advance of Atlantic air into Central Europe a more forceful cyclone can develop along this channel, which could extend its influence in Central Europe later. 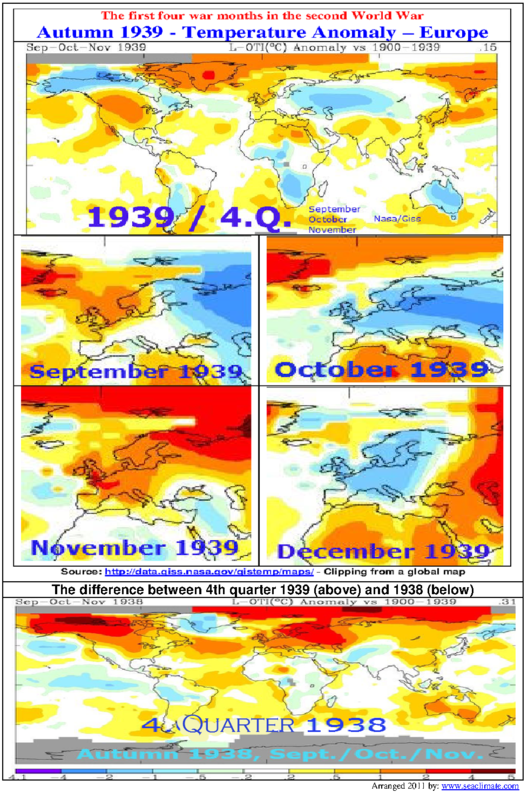 · September 29, 1939; General weather situation towards the end of the month clearly reveals changes indicating the end of the Indian summer spell which leads to a time of increased cyclone frequency in Europe . 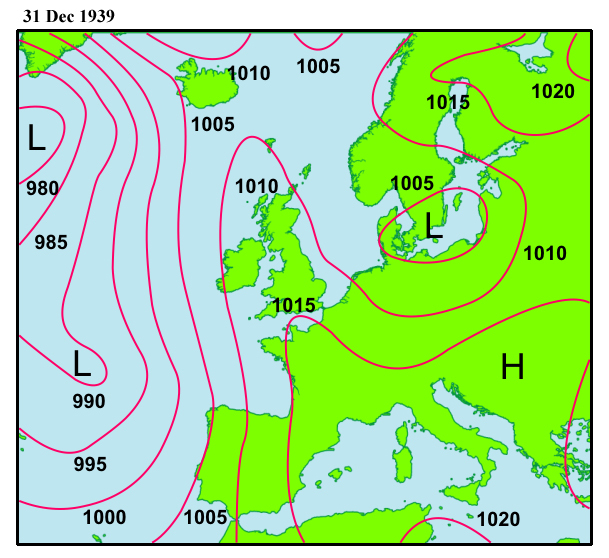 In the weather chart this is indicated by a decline of the Northwest-European high–pressure area (anticyclone), which dominated the general weather for a long time. This high, that usually is located far to the East (cf. the weather situation a year earlier) is responsible for the well-known late summer period of fine weather, now pushed so far to the West that Germany lies at its Eastern rim and thus got into the cold Northern stream which was interspersed with disturbances. 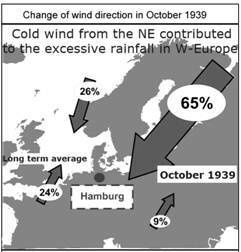 · October 13, 1939 ; Along with a peripheral low, the first effective gust of maritime air has reached Northern Germany . A continuous WWD (Westerlies), however, cannot be expected yet. · October 19, 1939; A broad high-pressure bridge has formed between the Atlantic and Scandinavian High. · October 23, 1939 ; usual weather is changing now and the high-pressure bridge which links the Azores High with the West Russian High is broken up. A transition to a west wind situation is on the verge in German seas. 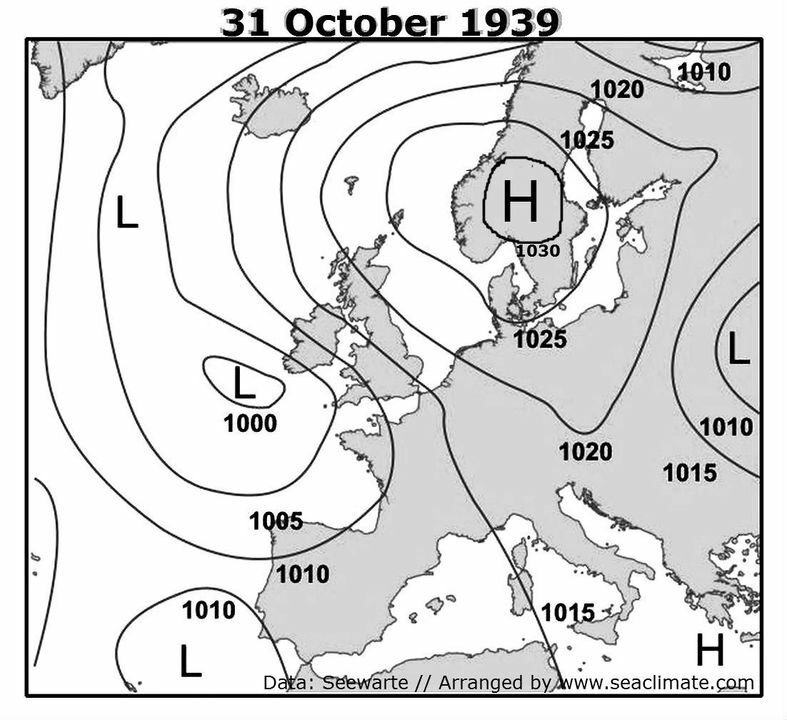 · October 28, 1939 ; since a high-pressure bridge from Middle Scandinavia to Scotland remains stationary, a further stream of cold air from the Nordic Sea area is cut off. 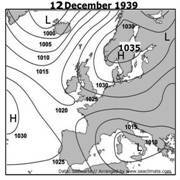 · November 5, 1939 : It now appears that – like in many earlier years – a WWD with lively cyclone activities will begin to move over Europe around the middle of the month. 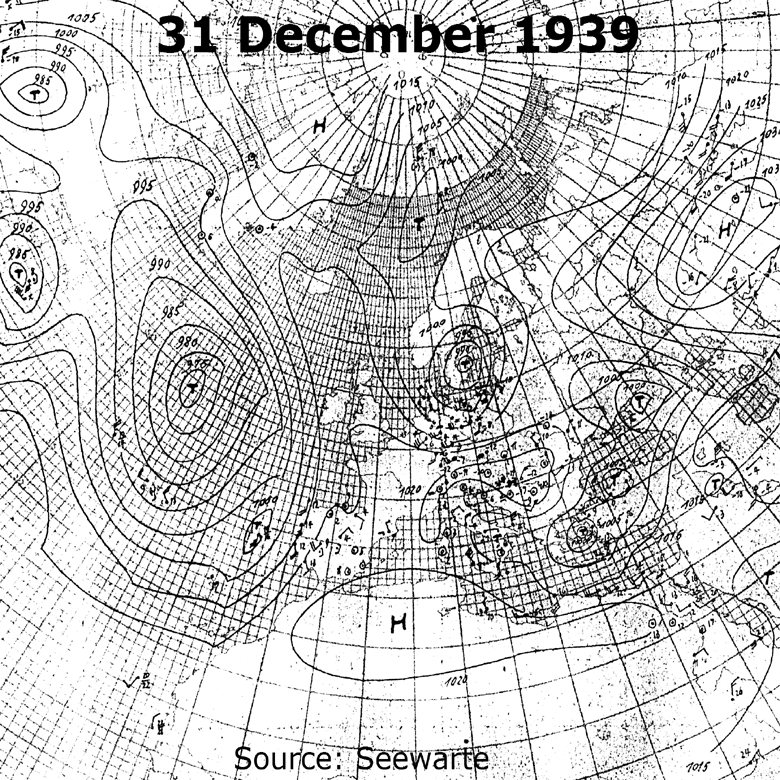 · November 14, 1939 ; it seems that a mainly sectional circulation is going to take over in the general weather situation: its pressure field will be characterized by a long high-pressure zone – Azores –Southern Germany – Southern Russia – and WWD-like turbulence activity north of these regions. · November 29, 1939 ; A West Siberian High is slowly retreating towards the East thereby allowing the disturbance coming from the West to penetrate even deeper into the regions of European Russia. 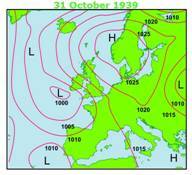 · November 30, 1939 ; a very distinct west wind weather situation rules over North and Central Europe . 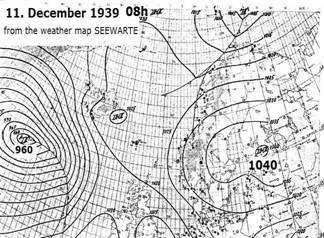 · December 1, 1939: The quite distinct Atlantic frontal zone of the last few days is disintegrating. Significant for all comments is that they talk about: ‘could, should, or would’, but a case of normal Westerlies (west-wind-drift) never materialized for long, as the two days from 29/11 to 01/12 show. Although a highly interesting bit of information, the matter is still not discussed in scientific literature, although it could have contributed significantly to the study of "blocking mechanism". In summary the expectations of the weather analyst for ‘lively cyclone activities’ did not materialize itself. Seawater temperature changes by devastating war machinery were not imaginable to weathermen at that time. What the analyst missed is the fact that the blocking of the Westerlies (WWD) started already in September, while the development since the 'first week of December’ is not the beginning, but nearly the end of the blocking process. d. Not competent enough to read the wind? 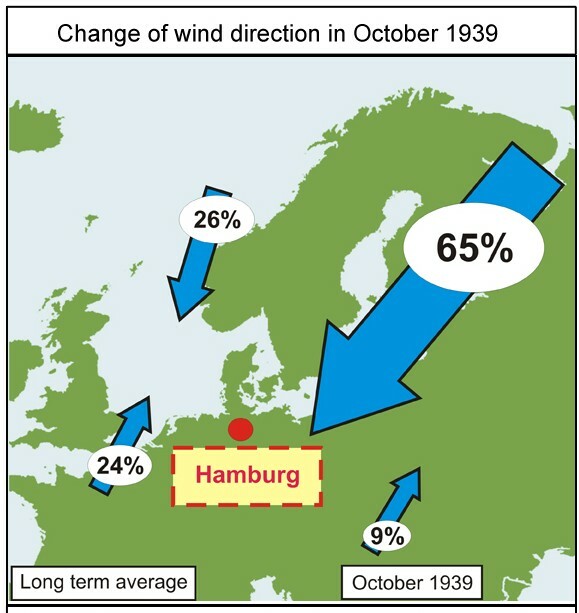 · Hamburg reported winds from the North-Eastern quadrant on almost two thirds of the dates observed (33% easterly winds out of 65%) while North-Eastern winds accounted only for a quarter (26%) of several previous years’ averages. Otherwise the most frequent direction of the wind – South-West (24%) – accounted for 9% of all cases. Thus the observations at this station alone show what the weather charts of an extensive area will obviously indicate as well (Seewarte, Nov. 02, 1939), next Figure C5-8. This is a very strong and clear indication that huge air masses moved towards the North Sea , due to unusually high evaporation in all sea areas affected by naval war. While the water of the seas was ‘stirred and turned’ the ‘steam’ rose upwards into the sky, causing an air inflow from easterly directions, which subsequently prevented low-pressure systems to travel along the west-wind-drift channel via North Sea and Central Europe into the eastern hemisphere. 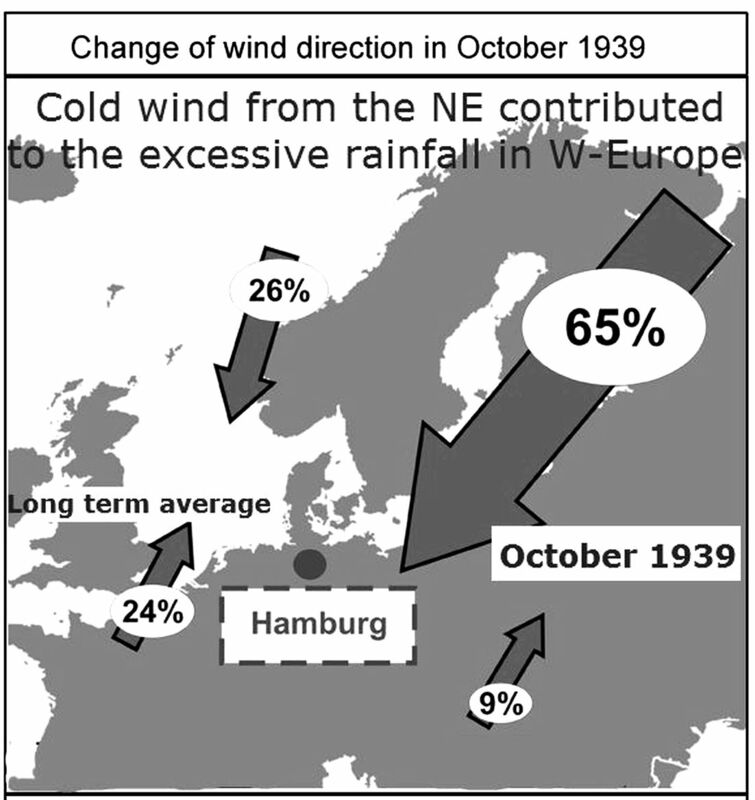 The foregoing investigation stressed the significance of the observed change of wind direction in Hamburg during October 1939. Wind direction had dramatically changed from prevailing SW winds to dominating NE winds. 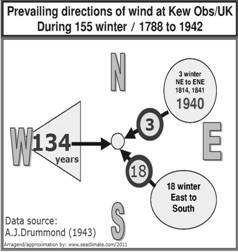 Even more significant is the already mentioned research by A. J. Drummond (1943) that the prevailing wind directions in South-West England (Kew Observatory near London ) had changed dramatically. 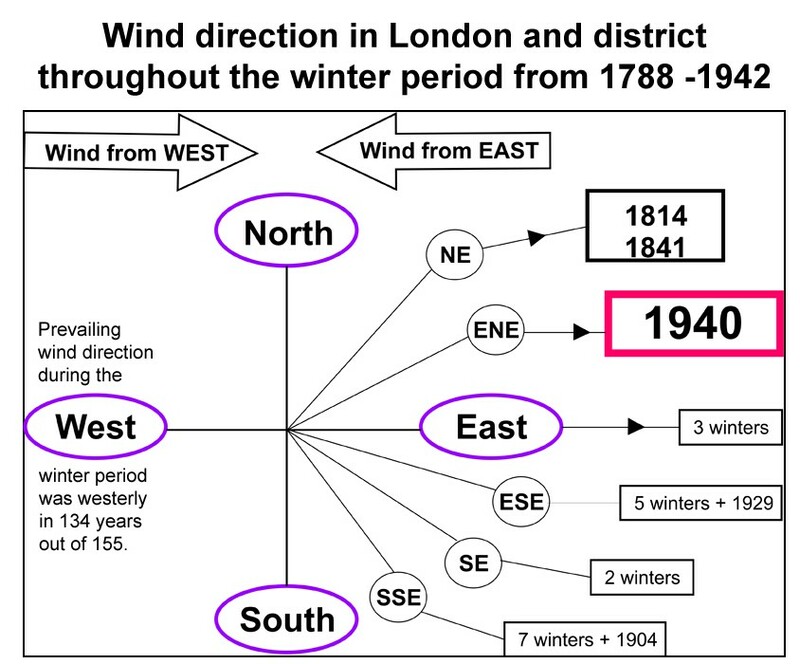 During the 155 winters from 1788 to 1942 only 21 had easterly winds whereby the three winters 1814, 1841, and 1940 the wind came from NE to ENE, meaning more northerly than East. 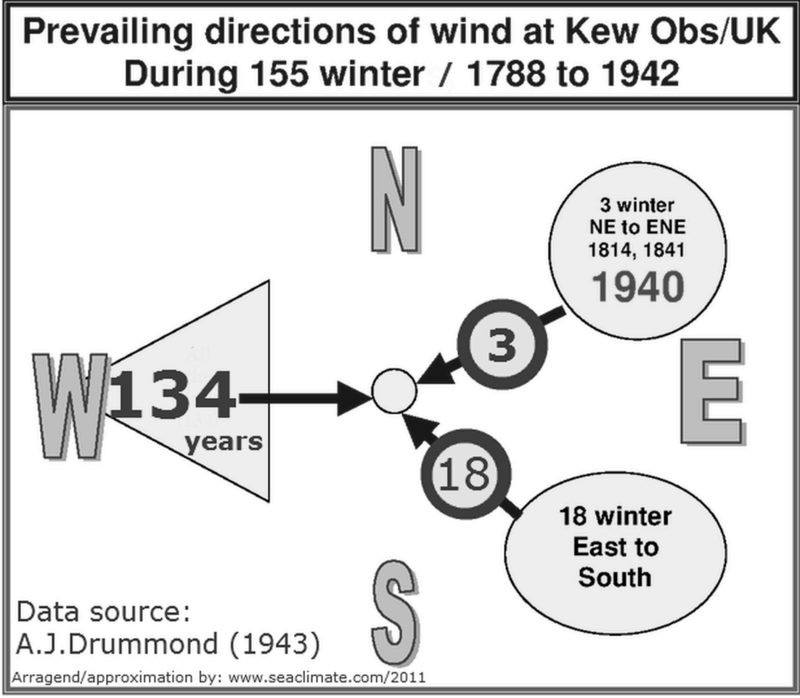 Another small number of winters since 1841 (1845, 1870, 1879, 1891, 1895, 1904, 1929) had prevailing SSE to ESE winds, Fig. C5-9. With the exception of the winters 1801 and 1804 all of these 21 winters with predominant easterly winds had a temperature below average (40.1°F; 4.5°C). While eleven of the above winters had means between 34°F and 36°F, only few years with westerly wind had means lower than 37°F (2.8°C), these being 1820, 1830, 1847, 1855 and 1886. That was pure blocking, but there is no sign that science has paid any attention to this important observation. 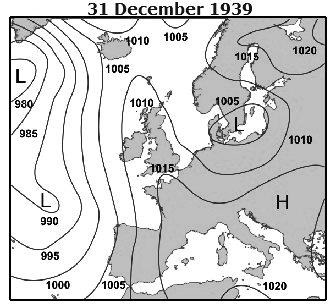 · __In December 1939 there was already the beginning of a pressure increase over the Greenland area, a slowdown of cyclones in the Iceland area, but an increase of pressure over the Azores and Mediterranean . On the other hand, since both, the Aleutian low pressure intensified and the air pressure over northern Siberia was also significantly reduced, the picture is about an average circulation. 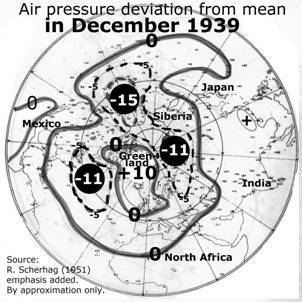 · __December 1939 shows over Russia a pronounced positive deviation instead of a negative anomaly, as evidenced by the weakening of the Azores high, combined with significant excess pressure over Greenland , which can be regarded as typical at the beginning of an extremely cold winter. 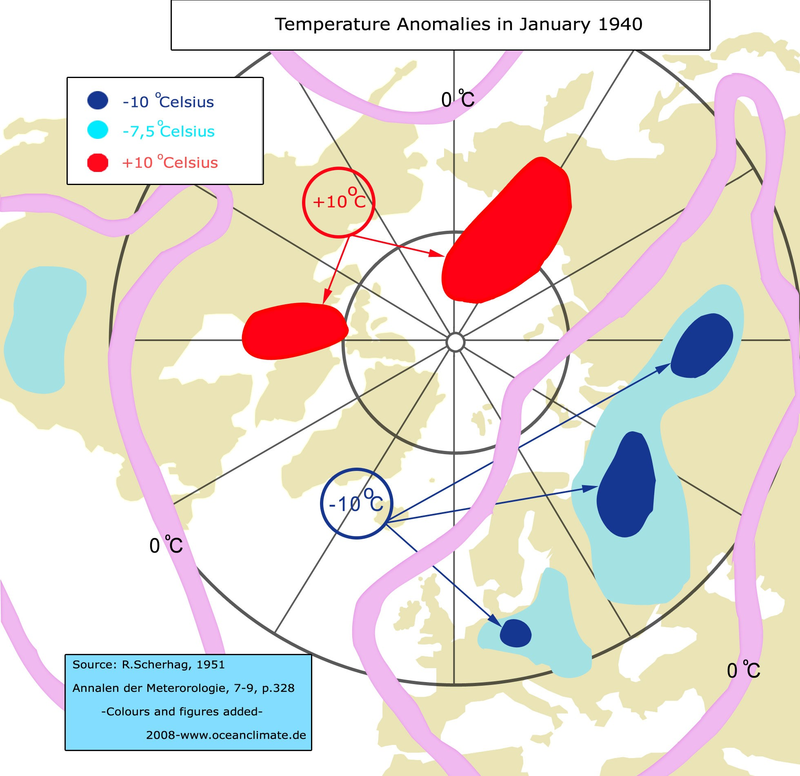 Particularly, the additional northerly flow component over Northern Europe is practically a shift of the cold pole in the direction of Europe , and thus a major cause for the formation of the extreme conditions in January and February 1940. Although the remark was made 60 years ago, the secret has not yet been lifted by science, so the cause is still hidden to us. Both temporal and spatial context of the war activities are unmistakable. This could be evaluated especially well by the observation made by the German weather service, the Seewarte, regarding the Westerlies (west-wind-drift), which was weak during the fist part of autumn, but ceased before the end of the year. 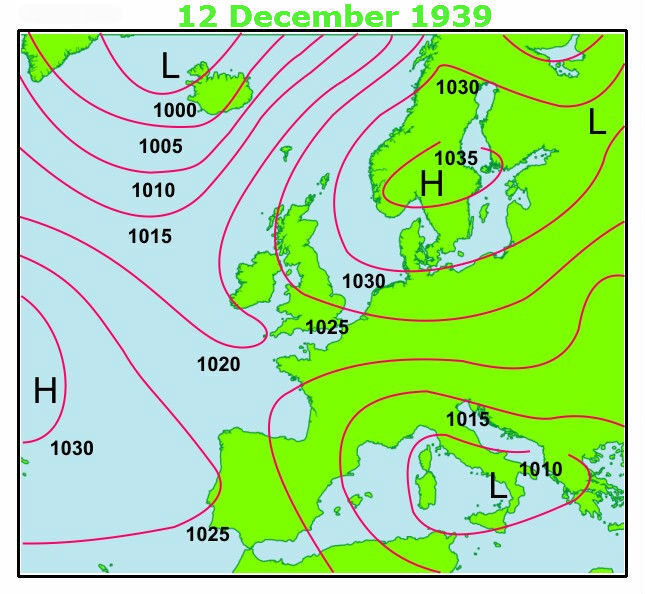 Instead, a stable high pressure system existed over Europe since December 1939, which supplied very cold air from the north and fended off warm moist air from the Atlantic (see Fig. above and Fig. C4-5, p. 63). Today the situation is called "weather blocking”. A high pressure area forces the movement of maritime cyclones (lows) into a different direction. The autumn of 1939 resulted in the development and impact of the blockade weather, which could not have been better presented by nature to the scientific community for a thorough investigation. It is as if a large trial had taken place. It was a purely practical large-scale trial, which ran in Europe since September 1st, 1939. Back then, when the trail commenced, there was not the slightest hint that a weather blockade could develop over northern Europe during the autumn months. That changed rapidly after the war unlashed physical forces of gigantic scale. Air and land activities intervened directly in the status of the atmosphere, for example, when thousands of aircraft left their contrails in the sky or when excessive burning villages and cities in Poland, moved dust and ash into the air, where they could serve as condensation nuclei for rain that indeed came down massively in some locations. Especially those naval activities from the English Channel to the North Cape and the Gulf of Finland were likely to influence the direction of low pressure areas. Thus providing humidity for the continuous rain along the river Rhine, and turning the prevailing wind direction to the opposite, namely from the south-west to the north-east quadrant. These are all criteria that have contributed to a weather blockading situation that eventually ruled the conditions during the first war winter. It all was anthropogenic in origin and should therefore be investigated very meticulously, to be understood, and explained by climate science.